Welcome to ExamNotes for Network+ N10-007. This series of posts is one pear each CompTIA Network+ sub-objective. This one addresses sub-objective 1.1 “Explain the purposes and uses of ports and protocols”. Because this sub-objective covers so much ground we have split it up into two and this is Part 2 of 2. Click here for Part 1. Please give us any feedback you deem appropriate. If you like it as is, we’d love to know. If you don’t like it, we’d love to know how to improve it. Best of luck in your quest for Network+ certification! Think of the Lightweight Directory Access Protocol (LDAP) as a phonebook for network services. The protocol serves to provide access to, and maintenance of, a distributed directory of the users, applications, available network services and systems throughout an IP network. Based on the x.500 standard’s directory services using the Directory Access Protocol (DAP) which relied on the 7 layer OSI model, LDAP uses only a portion of the x.500 standard set and uses the newer and more relevant four-layer Internet protocol suite on port TCP/UDP 389 at the application layer. By containing all the required network information including users and their credentials, LDAP servers can be used to quickly validate user access. LDAP can fulfill specific and detailed responses to queries about the network with precisely detailed information based on the parameters of the request. The more details specified in the request, the more concise the response. In addition to its own Distinguished Name (DN), object identification LDAP can ask DNS servers to locate other LDAP servers. The Lightweight Directory Access Protocol over TLS/SSL (LDAPS) is a secure implementation of LDAP. Since LDAP communication is transmitted in clear text they represent a vulnerability. Encryption is used to secure the LDAP transmissions. The encryption is provided by TLS or SSL and uses port 636. The H.323 standard is used to support point-to-point and multi-point VoIP and video conferencing. H.323 controls call signaling, bandwidth, and multimedia in VoIP calls and video conferences. 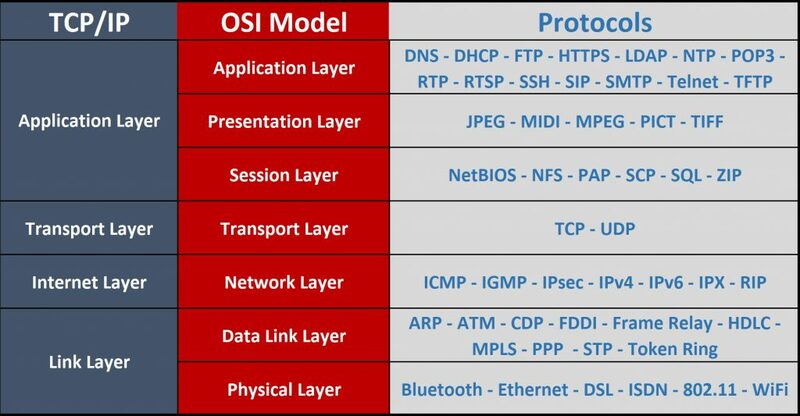 The Internet Control Message Protocol (ICMP) operates at the network layer of the OSI model. Considered a core protocol, it reports success or failure of packet transmissions. ICMP will not however correct a failure. Commands that utilize ICMP such as ping are used to diagnose network conditions when troubleshooting. UDP (User Datagram Protocol) is an unreliable connectionless delivery system for communication that also rides on top of IP. The difference here is that the packets are all individual and are all handled separately with no relationship to each other. This negates the flow control and other checks and balances offered by TCP. This means no solid connection, no inter-packet relationship like “I’m the 7th packet of 90”. Big things like error control, there’s no acknowledgment of packet receipt, dropped or lost packets. The sender has no information as to whether their communication was received or not. So why use UDP? It is fast due to this lack of ACK… UDP data streams continuously to the destination, ready or not. While TCP sends, waits for the ACK then sends more. This could add tangible time to large transmissions. TCP (Transmission Control Protocol) is a protocol that rides on top of the IP protocol (Internet Protocol) designed to address the reliability issues of IP. We’ll simply call IP unreliable for now. This is the main reason you see the TCP/IP protocol suite referenced as a single protocol in internet communication. TCP is responsible for the connection and the continuity necessary for reliable communication on any network, most notably the Internet. TCP opens a reliable “socket” on each end of the transmission throughout the entire communication. To effectively do this, TCP needs to know the IP addresses of the client and server plus the port each is using. This action is known as connection-oriented. Much like a traditional telephone call, pickup, dial, connect, chat and hang up. This is why Port/Protocol information that follows it truly significant. With the connection sockets established, TCP becomes responsible for breaking the data into packets of up to 64K but the lower level protocols that use it have much lower maximum sixes i.e. 1500K for Ethernet. TCP will break the data down to the necessary size and add its header. Now TCP is responsible for the delivery meaning that all failed packets are retransmitted (What? on the phone) and that they arrive intact in the correct sequence. Importantly each packet receipt is acknowledged (ACK). If it isn’t, it will be retransmitted. All data is delivered to the correct host in sequence and complete. The Internet Protocol (IP) has two versions, IPv4 and IPv6. We will discuss each version later in this series. IP is a connectionless protocol. IP assigns source and destination information to packets. It does not specify a path or establish an end to end session. IP packets can take different routes to their destination and may arrive out of sequence. For this reason IP is paired with the TCP protocol to create the familiar TCP/IP. A connection-oriented protocol establishes a reliable end to end connection between devices. TCP, Frame Relay, and ATM are examples of some of the connection-oriented protocols. As mentioned earlier the reliable connection created is much like a standard phone call where the connection is established, the communication takes place and the connection is terminated. Much the same way a connection-oriented protocol will establish the connection, transmit the data and Connectionless protocols can be paired with connection-oriented protocols to provide reliability. Connectionless protocols transmit data to the destination without first establishing a connection or guaranteeing delivery. IP, UDP, HTTP, and ICMP are examples of connectionless protocols. So an HTTP transmission will use the TCP/IP for its session. And that completes Network+ N10-007 Sub-objective 1.1!